Learn how LunaGraphica can give you a big design win for your promo. Our diverse client base gives us the opportunity to work on a thrilling variety of projects. From medical practices to nightclubs (and almost everything in-between), being fortunate enough to have such a variety of projects means our range of skills stays strong. Because they get to do so many things, our designers are constantly pursuing exciting and creative ways to make our client’s visions reality. You would think with such talented staff and interesting clients we wouldn’t be as constantly wowed by the design work happening around here as we are, but nothing could be further from the truth. 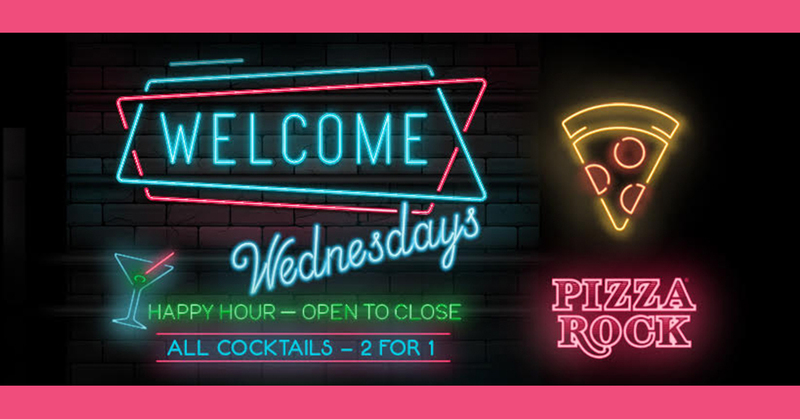 Our Senior Designer, Jennifer Meyer has blown us all away once again with the designs she did for Pizza Rock’s new Welcome Wednesdays promotion. As is evident by their name, Pizza Rock isn’t your average Pizza Restaurant. Yes, they serve delicious artisan pizza and craft beers (and much, much more), but they do it in a rock-n-roll atmosphere dedicated to the exciting nightlife one expects of such an environment. We work hard with this client to ensure our designs accurately portray the artistic and energetic setting their restaurants boast. 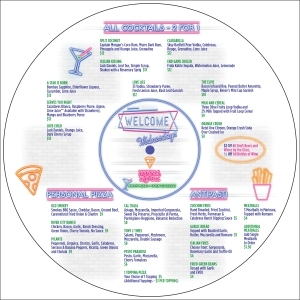 Jen’s use of neon glow and vinyl album shaped menu makes her work a welcome win for LunaGraphica and our client. When designing the art for promotions like Welcome Wednesdays we must consider the many pieces promotions must include. 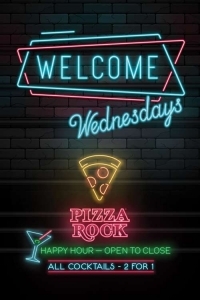 For this Pizza Rock needed us to come up with cohesive posters, social media headers, and a menu. All of these elements require different image sizes and layouts. It can sometimes be a challenge to incorporate the necessary design elements without the layout becoming crowded or too sparse. Her work is always stunning but Jen really shines when it comes to balancing design elements in a unified set of promotional materials. Check out her amazing work below. Are you looking for a promotional package that will get your products or services noticed and remembered? Like what you see here? Contact us now for a free consultation and find out what LunaGraphica can do for you!